Ms. Bharti Patel is CEO of ECPAT UK, a leading children’s rights charity that campaigns against child trafficking and transnational child exploitation. Bharti has more than fifteen years’ experience addressing human rights abuses, leading high-profile research, campaigning, and working with advocacy organizations in the UK and India. 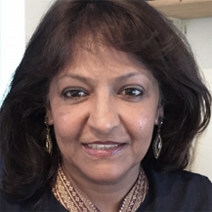 Bharti’s passion to challenge the root causes of child exploitation and abuse underpins her leadership role with ECPAT UK, where she has overseen important changes to law and policy regarding child protection and trafficking prevention. In the UK, her prior achievements include successfully lobbying for Britain’s first-ever national minimum wage legislation and helping secure basic employment rights for low-paid and part-time workers. In India, she delivered sustainable development programs to strengthen food, water, and livelihood security for vulnerable communities. An accomplished speaker and writer, Bharti has been featured widely in the British print and broadcast media and is regularly quoted in articles on poverty, inequality, child trafficking, and child protection.